Mobile Apps get rejected from the Apple App Store all the time. In fact, about 30% of all apps that we try to publish your iPhone and Android Apps are not accepted. Focusing primarily on the Android market. Creating an .apk file to share with your customers so they can download it. Some folks even opt to share their app on the Cydia app store, which is technically against Apple's terms and conditions, but it means that jailbroken devices can access your app. Regardless, placing your mobile app in the Apple App Store has clear benefits, considering many people are more accustomed to downloading apps through app stores, as opposed to sideloading .apk files, and the iPhone market is huge, so narrowing down to only Android phones could hinder business. The main goal is to get past those Apple gatekeepers and see your shiny new app in the Apple spotlight. How do you prevent Apple from rejecting your mobile app? Keep reading to find out. 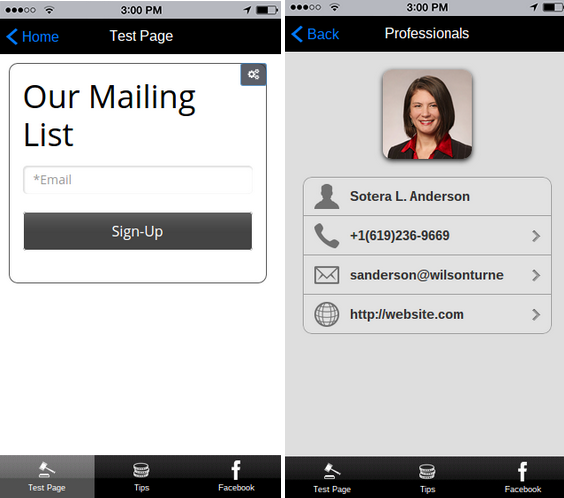 Is there a button on your app that leads to a blank page? Is a gallery page filled with only two pictures? 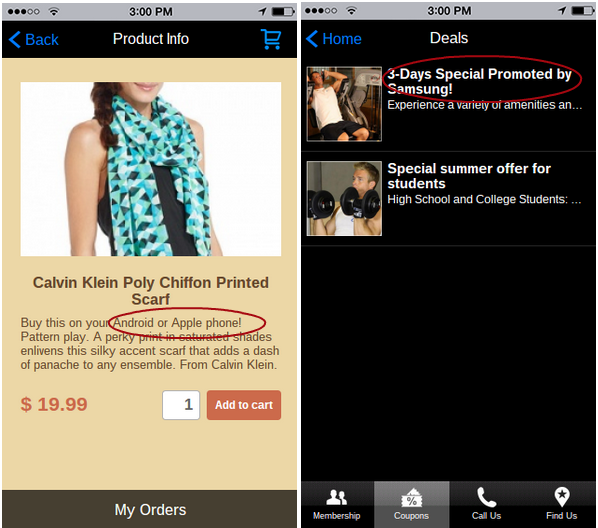 How about your mCommerce store? Have you filled in all of the pricing and product details? Apple puts a hard focus on only accepting apps that are useful to users, and a non-completed app is not all that useful. To start, ensure that each of your pages is filled, the buttons work, and tabs lead to the appropriate places. It's also worth noting that any mention of a “test,” “beta” or “demo content” will trigger the alarms at Apple and make them assume that you haven't filled everything in properly. You'll also notice in the screenshot above that the app has a website.com mention, which is clearly not finished. As you may know from some of the lawsuits that Apple has fought with Samsung and other companies, Apple is extremely protective of its design trademarks and copyrights. If your app has elements that look too similar to an Apple button, page, tab or even keyboard design, you may find yourself in the rejection bin. Take a hard look at your app and place it next to several of the apps you can browse through in iTunes. Strive to use designs that not only look different from Apple's, but ones that also help with a unique branding strategy for you. Apple hates it when apps make mention of competitor brands like Samsung and Android. Even a simple photo could trigger a rejection. Keep in mind that Apple even considers some apps competitors, even if those apps are in the iTunes App Store. For example, you may get flagged for a mention of WhatsApp, any camera app or even a keyboard app, since Apple has its own default keyboard. Run through your app to remove mentions of specific companies that might conflict. When you submit an app to Apple, you are asked whether or not the app includes inappropriate content. So, if there's sexual content or crude humor, you need to tell Apple this. The application process has all the questions outlined for you to check off. The only way you would miss this is if you were trying to deceive Apple and suggest that the app is not crude or innapropriate. Just be honest during your application so they can warn users ahead of time. If you use any pictures, videos, quotes, designs or any content that was created by someone else, you must receive documentation that you are allowed to use it. This includes trademarks, trade secrets, copyrights and more. Think about your content and how you acquired it. If you didn't create it yourself, you probably aren't legally allowed to use it. If not, take the content off your app or contact the creator for permission. What's the kicker? You also have to credit the creator inside the app. Apple was pretty much built on clean, beautiful looks. Just think about the Macbook or the iPhone interface. If your app looks like it's built by an amatuer, or like it's from ten years ago, you'll get rejected. The cool thing about making your app through iBuildApp is that you already have the tools to make your app look like it was made by a professional. 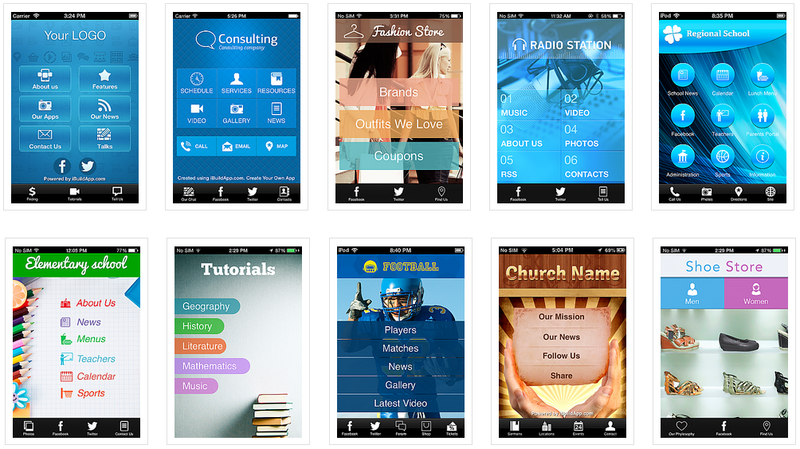 Choose one of the sleek templates and customize it. Just remember to keep it clean and that all of the pictures are in focus. Apple compares app content to content you would find on the internet. So, when Google looks at a site and sees that the content is boring or of low quality, they don't show it high in the search results. The same goes for Apple. Think about how you can fill your app with engaging pages, media and features so that your users are constantly discussing, checking the app and using it for their own good. Check out some of the cool features at iBuildApp to maintain a super cool app. That's it for learning how to prevent Apple from rejecting your mobile app from the iTunes, or Apple, App Store. Let us know in the comments sections if you have any questions. Thank you it is very informative and i'm looking forward to publish my first App.